Following on from our non-traditional colour challenge last week, I’ve decided to use non-traditional papers for my Merry Monday card this week. This is because I’m trying to use up as much of my DSP that I can. I have so much that if I didn’t buy any for the next 3 years, I still think I’d have enough to last! Does everyone else have a lot sitting around collecting dust like I do? Really like this card! I like the fact that the non=traditional colors were used, yet it is still Christmas-y! Great job, Thanks for sharing! I’ve been admiring this card with the beautiful non-traditional colors, Narelle! I’ll bet I have as much paper as you do. Then I bought some from the clearance rack since it was such a good deal. Now I really need to use it! Enjoy your week! OH this is just gorgeous!! I love the color combination and your amazing details! So pretty! Love the colours Narelle, this is one of my favourite combos for Christmas and yes, I do have HEAPS of designer paper, ribbon, stamps, inks…collecting dust…LOL!!! I am trying to use them up too!!! Very pretty card! What great contemporary colours for Christmas, Narelle. Love all your details – you do amazing things with just 2 colours! 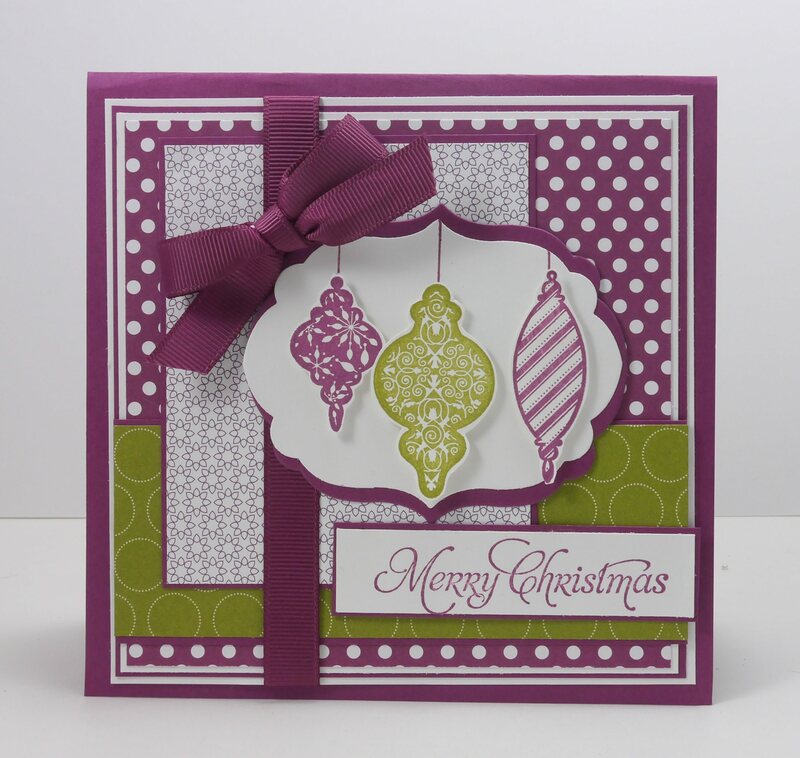 Very pretty card Narelle, these colours are fabulous and the ornaments are gorgeous. LOL! YES, I have tons of DP….I could never use all mine in a lifetime either! I love your ornaments and glad you chose some interesting colors….makes for a terrific card! The colours are fabulous Narelle, Love all the texture and patterns they make a pretty Christmas card. I absolutely love this, Narelle! Love the non-traditional colors and the mix of patterned papers! Gorgeous! Love your style, friend!